December 17th is my birthday, and as usual I’m giving YOU a present. To get All That Remains free, use coupon code ME24A at checkout. For Back to Newtonberg, use coupon code PC28U at checkout. All of the books are the latest updated versions, and Back to Newtonberg includes an all-new bonus short story! Please share this post with everyone you know to help get the word out about the books! Thanks again to everyone for all of your support this past year. I can honestly say that this has been the best, most exciting year of my life. 2018 is already shaping up to be even better! Looking for a stocking stuffer for the bibliophile in your life, or is someone special getting an eReader from Santa? Just click on the coupon below and print it out! First, a warning: this entry will probably sound like sour grapes. But it’s not, honestly. It’s just me giving voice to my frustration because I feel that my book wasn’t given a fair shot. I’m not upset that the reviewer didn’t like the book. What I am upset about is that based on her review (in which she got the name of the book wrong for a start), she didn’t read it. Or if she did, she didn’t pay attention to what she was reading. I don’t claim that the Newtonberg books are great literature. Although I admit the influences of Garrison Keillor and Jan Karon, I do not pretend that I am even near their league as an author. But I do know that I told the story better than this review makes out. Um… Madge is DEAD. Has been since book two. The reviewer even points this out in one of the later paragraphs. And the document is her story (which makes up the bulk of All That Remains) that MIKE received and is shared with Nikki. And furthermore, it is a very small part of this book. The manuscript is referred to briefly in the first few chapters and that’s it. The whole tone of the piece is very condescending. Maybe she didn’t mean it to be taken in such a way, but I read “OF COURSE the people of Newtonberg embrace her whole-heartedly” and “The Good Father Nichols” as if being said in a very snarky manner. Look, I understand that not everyone will like the books. And I take to heart her comments about adding depth to characters and developing the plot a bit more. But please — make an effort to at least present the facts correctly. Even Roger Ebert gave a fair review of the content of films he hated. When he reviewed The Brown Bunny, he said he disliked the film, but at least his readers knew the basic plot when they finished reading his column. Being that this review might be the only exposure some people in East Texas have to my book (not to mention Galveston — where I have found out these reviews are reprinted as part of their local magazine), I hate to think that what they are reading isn’t true. Rant over. I’m off to plan my next book. A little down, but not out by a long shot. Okay folks. My official Facebook page (at http://www.facebook.com/demprimo) page is at 45 46 likes — and while that is nothing to sniff at (especially since I haven’t exactly gone out of my way to promote it), I’d really like to see a bit more. YOUR PART: please help me promote the page. Share this post with friends. 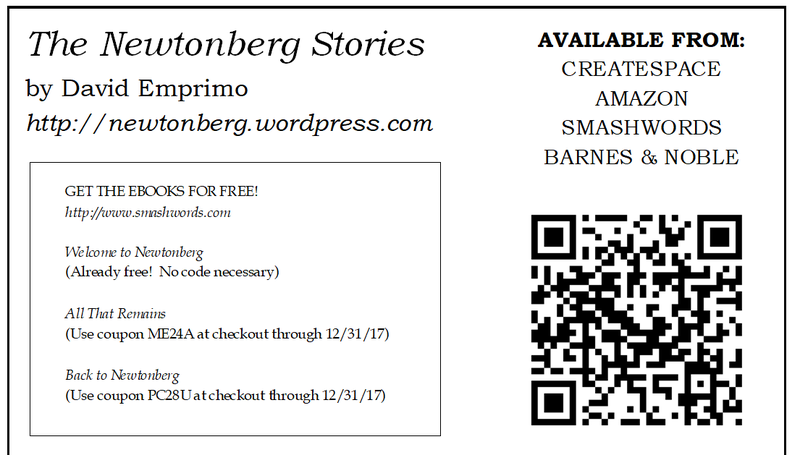 Tell a stranger about my books. Write about it on the bathroom wall. (Um… maybe not that last one). MY PART: If we can get the count up to 60 likes, I will reveal the book cover for Back to Newtonberg. Help me get the page up to 100 likes, and I will post Chapter One here on the Official Blog.